The third stage provides the majority of the velocity change needed to leave Earth's gravitational pull and to inject the spacecraft onto a trajectory to Mars. To leave Earth's orbit, the spacecraft has to fly faster than Earth's escape velocity (the velocity required to escape the gravitational influence of Earth on the spacecraft). Prior to the third stage firing, the spacecraft is only going about 19,500 mph and it is stuck orbiting Earth. The motor firing boosts the speed to roughly 25,000 mph (escape velocity) and frees the spacecraft to escape from Earth orbit. To reach escape velocity, the solid rocket motor burned for about 90-seconds for both Rover A and Rover B, using approximately 2,020 kilograms (4,453 pounds) of solid propellant that is composed primarily of ammonium perchlorate and aluminum. This propellant produces an average of 66,000 Newtons* thrust. (*A Newton is a unit of force required to accelerate a mass of one kilogram one meter per second). 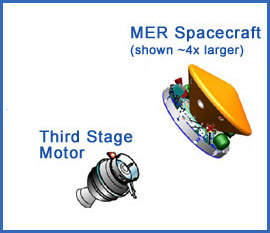 In order to keep the third stage lightweight, it does not carry any "brains" or axis-control systems. Therefore, to ensure the rocket stays on course and that the motor flies in the same direction while it is thrusting, the third stage is spun up like a top. This spin is much like the concept used when throwing a football and putting a spin on it to thrust the football in a constant, precise direction. For rocket science, this is termed "spin-stabilized." After the spacecraft is on its way to Mars, it needs to spin fast enough to stay stable, but not so fast that the navigators would later need to use too much fuel to turn the spacecraft for correction maneuvers. The spacecraft uses its own propulsion system to slow the spin down further to 2 rpm.